I have a plethora of radishes – most slightly past their prime. The recent hot weather has made them grow quickly, and they are rapidly becoming large and bitter. So when I saw a hundred-year-old recipe for Creamed Radishes that began with the following sentence, “For this radishes which are a little larger than those desired to eat may be used,” I knew that it was a recipe that I had to try. I was pleasantly surprised by how well the Creamed Radishes turned out. They were soft and easy to cut when my fork, and the cream sauce nicely balanced the cooked radishes’ mild tangy zing. That said, I was surprised and disappointed that radishes lose their lovely red color when boiled. The cooked radishes were pale pink – and a few were so faded that they were almost beige. I’ve already made this recipe twice, so Creamed Radishes definitely are a vegetable that my husband and l enjoy. Perhaps the reason this dish is not popular is because of its homely color, but if you can get past the color, it is definitely worth a try. Wash the radishes and cut off the leaves and root, but do not pare off the red skin. Put radishes in a saucepan and cover with water. Add salt and bring to a boil using high heat. Reduce heat and simmer until tender (about 25 minutes), then drain. In the meantime, in another pan, using medium heat, melt butter; then stir in the flour. Gradually, add the milk while stirring constantly. Continue stirring until the white sauce thickens. Gently stir in the cooked radishes. Remove from heat and serve. 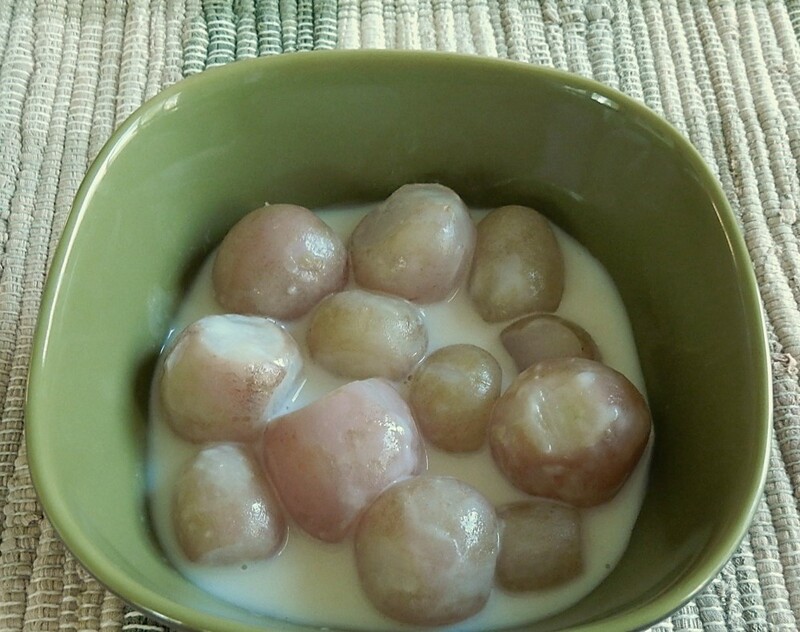 Posted on June 3, 2018 June 1, 2018 by SherylPosted in FoodTagged radishes, recipe. I’m glad you like radishes. If I had a bunch that were beyond prime, I’d take the easy way out and sneak them in the garbage. I enjoyed your writing about them. Of all the recipes I never imagined, this would be near the top. Still, it’s good that you found a new way to enjoy them. I don’t buy them, so the chances of my having some over-the-edge radishes are pretty slim, but if I ever do, I’ll know what to do with them. I find it fascinating that some vegetables like radishes were served in a wider range of ways a hundred years ago than what they are now. If you like other cooked root vegetables (turnips, parsnips, etc.) I think that you’d enjoy this recipe. Interesting. The only things that I wondered about was the cooking time. 25 minutes seems a long time? The cooking time is very dependent upon the size of the radishes. My radishes varied in size, and I cooked them until the largest could be easily poked with a fork. This is a great idea for using bigger radishes. Pan roasted radishes sound really good. I’m going to have to give them a try. mmm. . . This is sounding even better. I’m definitely doing to have to make this. Oh my! How interesting. I’m forwarding this to my gourmet/gardening son. He might just want to try this. I think that he’d enjoy them. I love radishes in salad. You are correct that they look rather unappetizing boiled, but I can imagine the taste and I’m sure I’d like it. Thanks! It’s too bad that the color fades when they are cooked, because it really is a nice dish. I would never have thought about boiling radishes, but this sounds delicious and will have to try it! I would sprinkle some parsley in just for appearance. Parsley would add some nice color. Cooked radishes… never heard of it before. Good to know though! It would be nice if they would keep the red coloring,….throw in a red beet with them? The strange thing was that the water the radishes were boiled in turned a lovely shade of red – yet the radishes lost their color. Maybe a beet would help. I love radishes but have never, ever heard of cooking them! I think our grandmothers used many foods a lot differently than we do. I agree – It’s fascinating how some dishes stay the same across the years, while others change drastically because of changing fads, cooking methods, availability of ingredients, etc. You should give this recipe a try. Cooking radishes does take a lot of the bite out of them, though they still have a mild tang. I had similar thoughts about the color. If I hadn’t expected them to be red – I think that I would have been okay with the color they ended up, which is similar to the color of some small potatoes. I love the story about your pregnancy and radishes. It’s so much fun. I love old recipes! I have never heard of making radishes like this! Encouraged by your optimism I tried this recipe over the weekend– and we loved it. Who knew, eh? Thx. And, I”m going to have to give a radish sandwich a try. 🙂 I can picture older relatives eating them when I was young, but I don’t think that I’ve ever actually had a radish sandwich. I would never have thought to cook a radish. I use them in salads and just to eat…used to grow them but have given up vegetable gardening. Now I go to the farmers’ market. But this sounds intriguing…so my next trip to the market I’ll look for larger radishes and see how it all works out. Sometimes I get in a rut. This recipe is a nice “new” way of using a vegetable. I think that you’ll like the Creamed Radishes. This looks kind of wonderful. I discovered cooked radishes a while ago, but only sautéed in butter or grilled in a packet. I like this option!